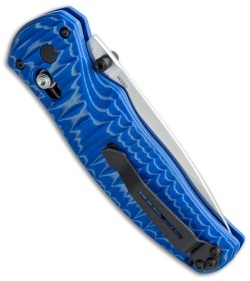 The Volli 1000001-1601 is a limited edition model with layered blue G-10 scales and an M390 steel blade. The Volli is an impressive knife line that features Benchmade's AXIS-Assist for quick, one-hand opening - just give the ambidextrous thumb studs a push and let the knife do the rest. Designed to please and with comfort in mind, the handle sports milled, contoured G10 scales. Strong and reliable AXIS lock with stainless steel liners and a split-arrow clip for tip-up left or right hand carry. The drop point style blade is made from S30V stainless steel. Super sharp right out the box. 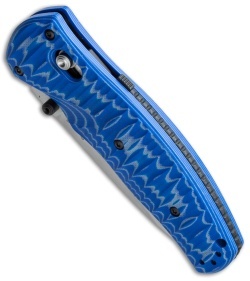 I love the thin handle which is very comfortable in the hand with enough heft to support the bite. The blue and grey are pleasing colors and the texture is perfect. 20cv is one of the best steels for edge retention and non corrosion. Easily fits in the pocket and the clip holds it well. 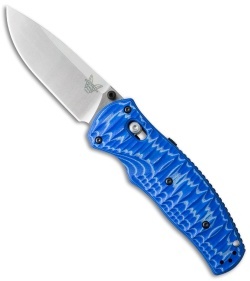 It's about the same size and heft as a g10 griptilian with the added benefit of the assist. I bought it with no regrets. Love the scales and handle. The G-10 feels great in your hand perfect size handle. Blade size is perfect for every day use. Axis assist works great. Knife steel is superb would highly recommend.